Wow I have some catching up to do. I haven’t had much spare time lately but I did get some painting done this Fall and early winter. 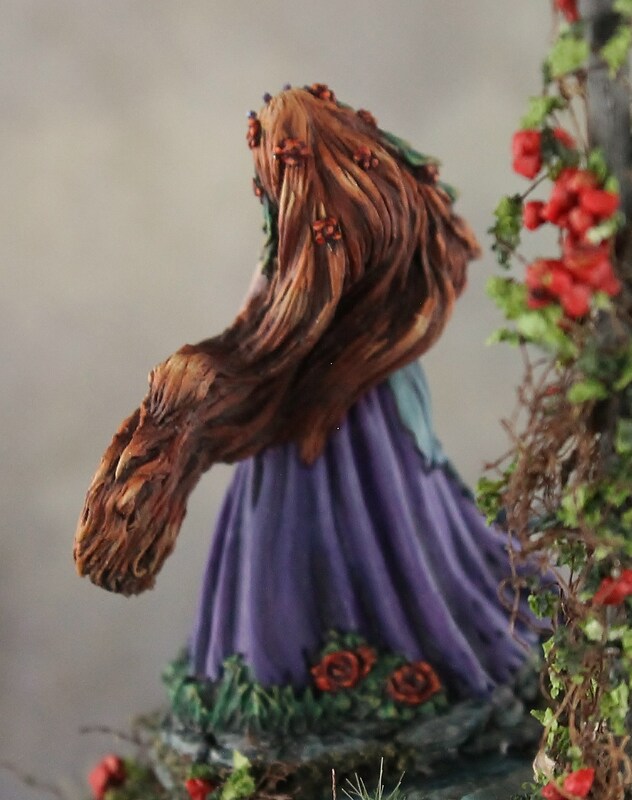 For the winter exchange I chose Reaper Miniatures Ghost Bride. Since she is a ghost I wanted to stick to a fairly monochromatic scheme. I used mainly blueish grays and tried to give her dress a bit of textured and old look to the paint work. This also gave me an excuse to practice an odd skintone to give a bit more warmth to her skin I shaded it will a dark pink to separate her skin from the cloth. Here she is on a display base. And as a gaming piece. I also accomplished a few more Khador miniatures including Zerkova for a friend’s army and a unit of Doom Reavers for my own. I really had some fun with Zerkova’s base adding some icicles and water effect. Since 2015 is just about finished. 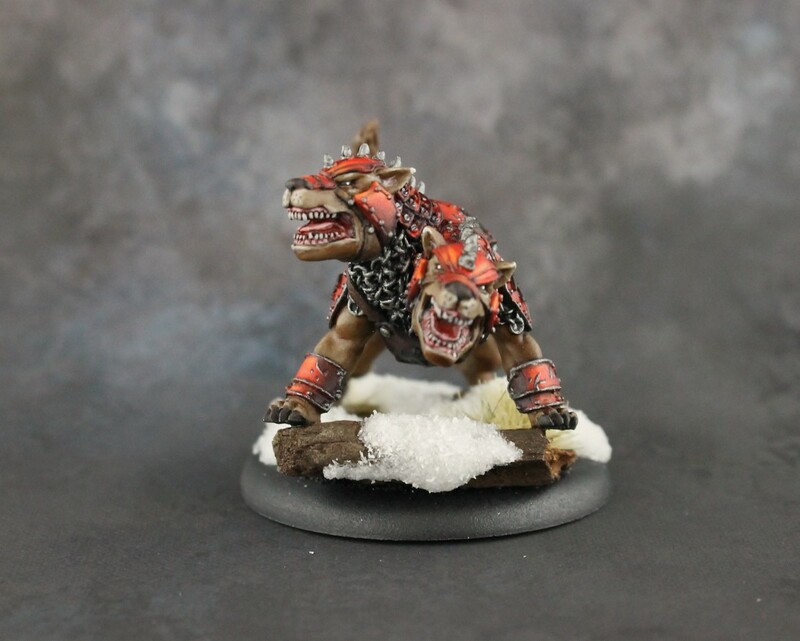 I look forward to a new year of painting in 2016 hopefully with new challenges and fun miniatures to paint. 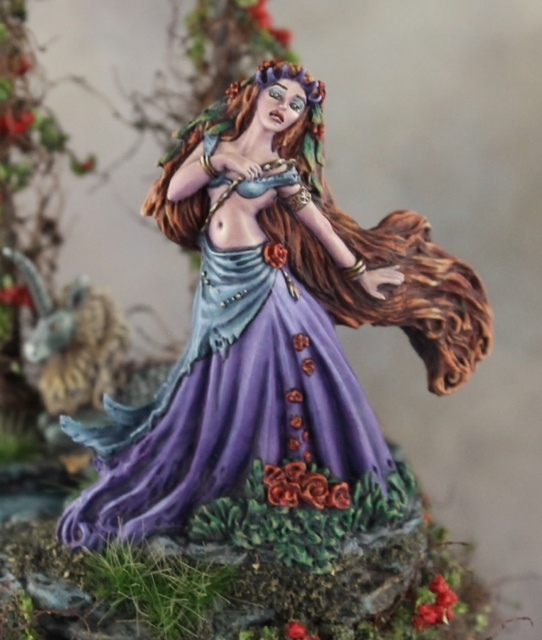 I hope to push the limits of my painting and achieve some beautiful minis next year. Happy Painting everyone and I wish you all a wonderful New Year. 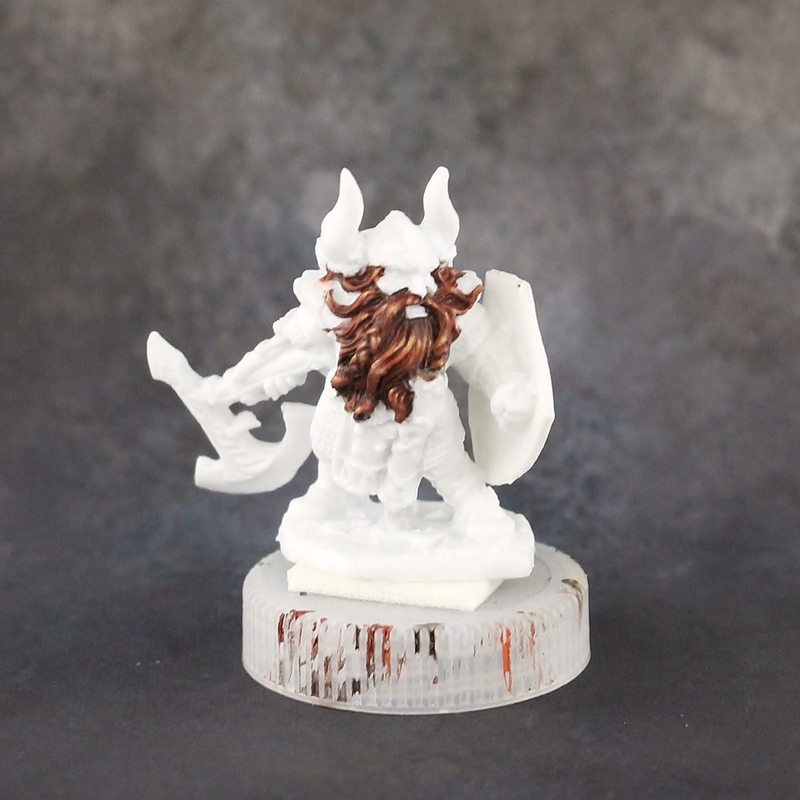 Over on the Reaper Forums I started a red hair tutorial and thought I would cross post it here as well. 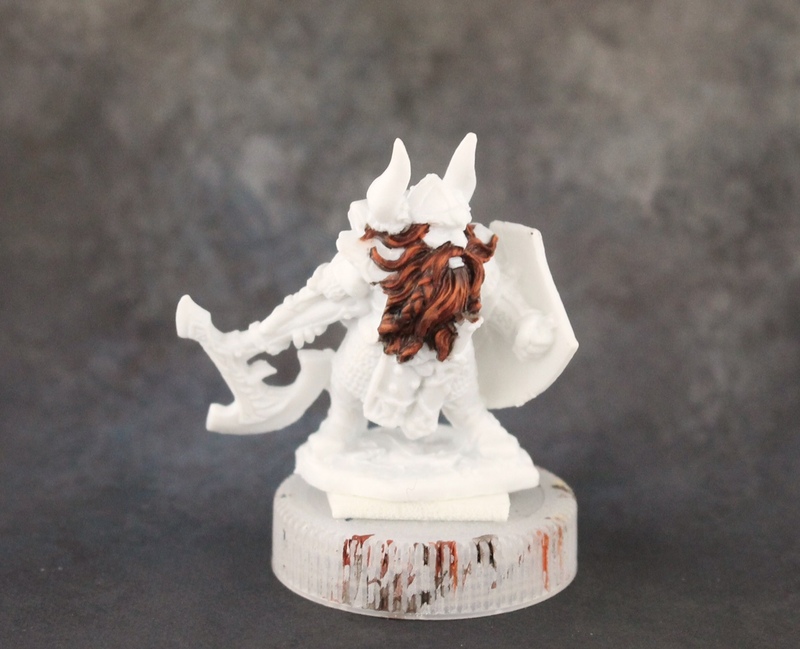 I love painting red hair and have done so on a far amount of miniatures. The fun part with any hair color is you can use almost any shade and vary it from mini to mini as real hair has so many different shades and variations naturally even on just one person. 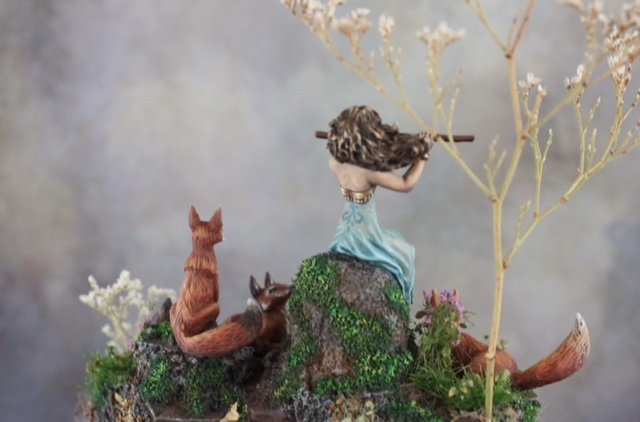 I plan on painting three miniatures with red hair for this tutorial and varying it on each one. Here are the paints I selected for this tutorial. And of course the victims. This part will be all about Reaper’s Bones Dain Deepaxe 77074. Here is my palette of colors I used on him. I usually mix these up as I go but since I am trying to capture each step I mixed it all at the beginning. To preserve the paint I put a wet sponge on top of the wells I was not using especially since I paused for photos and of course to pet my dogs when they ask for attention. Step One: For Dain I started with my Brown liner and painted all his hair. I wasn’t as concerned about coverage at this point as you can see in the photo. However I did make sure all the recesses had a good coat with no white showing. Step two: Here I took my mix of brown liner/Auburn Shadow and made sure to get a nice even coverage, in the deepest recesses you can still see the brown liner but most of it was covered. Step four: Time for carrot top red. I make sure my paint is the consistency of skim milk at this point and will likely go over an area at least twice sometimes three if I need better coverage. I am still keeping my highlights fairly broad but a bit tighter than the last step. This is the final step I used my round 2 for. Step five: This step I switch my brush to my sable round one, and I keep my round 2 close by damp so if I need to feather out some paint with it I can or if I mess up and want to take off some paint I can use it for that as well. I think this step you can really begin to see the highlights taking shape. I took my highlight orange and again just like step four applied the paint carefully where I want it with a few passes until I get the coverage I want. At this point sometimes I will feel it is necessary to use a glaze of my Auburn Shadow to hit up transition areas. I define glaze here as a super thin paint almost to wash consistency that I diluted with distilled water that with only a small amount on my brush I apply just where I need to ease the color transition. 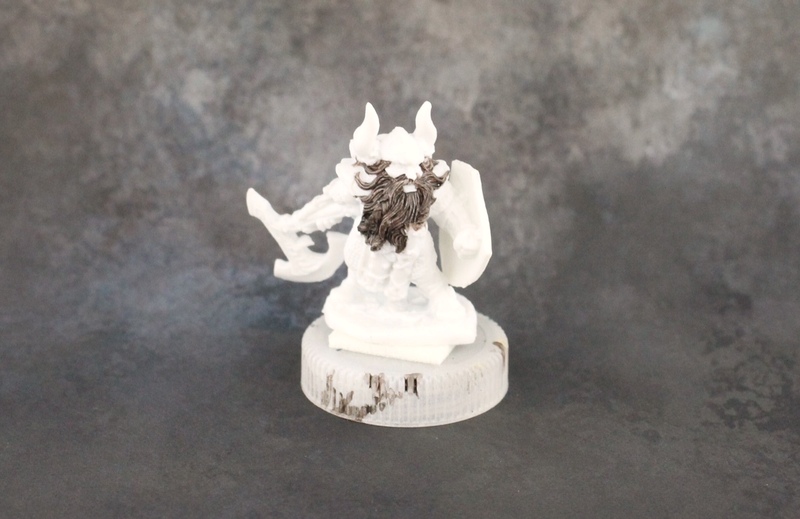 I did not do a glaze on him I felt overall his hair looks ok without it and I wanted to show how you can get away without it especially for a gaming table top mini. Step six : I skipped using my highlight orange and blonde shadow mix and went with just my blonde shadow for this step. I could use the mix to ease some transitions but for hair especially beards I think it can work without it. Keeping the highlights much smaller and trying to pick out where I really want my light reflections I used my blonde shadow and again did this a few times until I achieved the proper coverage. Step seven: Not a big difference from step six just tighter highlights. I used Blonde hair (sorry I didn’t have it on the palette at the beginning) again thin like skim milk. And carefully applied the highlights on the tops of the areas that the light would hit the most. And that’s it if I was planning to paint him up to a higher standard I would go back and glaze over some of the transitions and possibly revisit the highlights as the glaze would tone them down. But for a fairly simple but effective red head he works, and overall the steps are fairly minimal. I shall paint the ladies within the next week and let them share the spot light as well. For now goodnight and happy painting. Wow, Gen Con was a whirlwind of excitement and fun. Of course we had a blast and wished we could’ve stayed longer, but I am glad to be home. This year was my first year teaching and I hope all my students enjoyed the class, I know I did. I learned from both classes and hope to refine my teaching skills for next year. 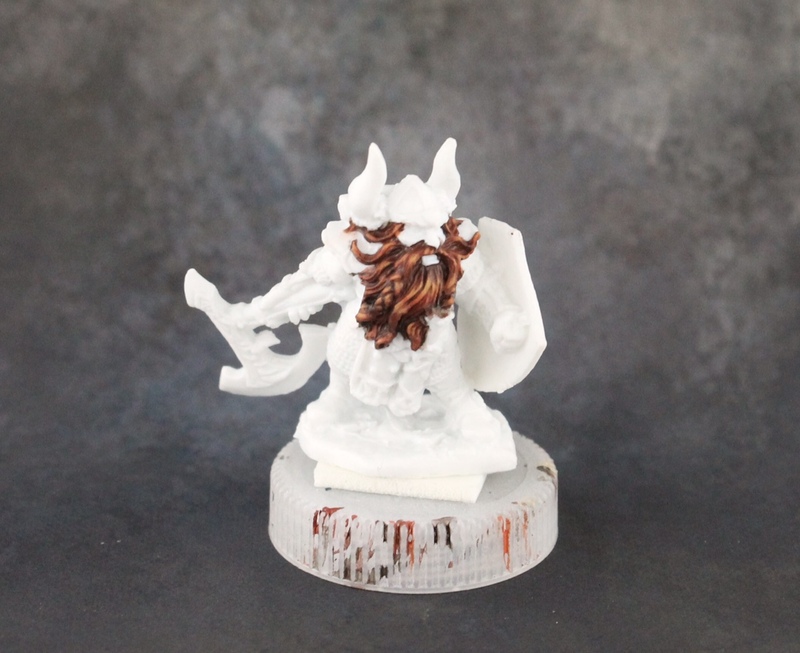 All my students did quite well painting and I hope to see some emails of finished photos of their minis soon. All my events I was able to attend (Unfortunately I was a bit ill and had to lighten my schedule a bit to keep up) were great and tons of fun. Here are a couple photos from my speed paints, they are always fun you get a miniature to keep and of course the opportunity to chat with a few other painters while you do it. I did quite a bit of shopping this year and was able to chat with a few great people in the vendor hall. As always I had to visit Jim Ludwig in the Dark Sword booth not only to pick up some miniatures but to chat with him and Jessica Rich. I scored all of the new Dark Sword goodness and even a few extras of the Tony Diterlizzi minis while I wait for my kickstarter ones to arrive. And since Tony Diterlizzi was the artist Guest of Honor I was even able to have him sign a couple of the miniature blisters, while I picked up an art print. I brought home lots of loot as you can see. Oh and I was lucky enough to bring home a few awards as well. This year had so many beautiful miniatures and I feel honored to be among the few who brought home an award. 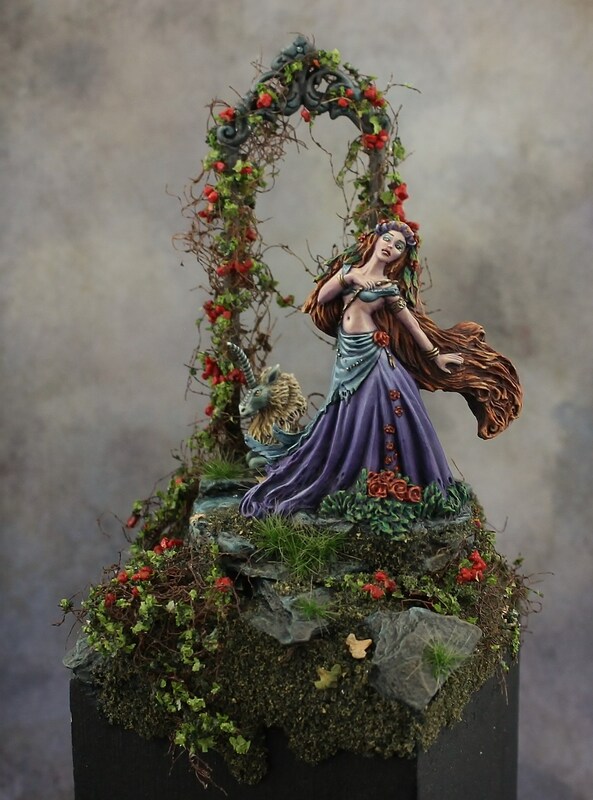 My Dark Sword Euterpe Muse “Spring of Music” piece was given a Gold and placed 2nd in the Diorama category and also chosen for 2nd place for the Dark Sword Manufacturer award. 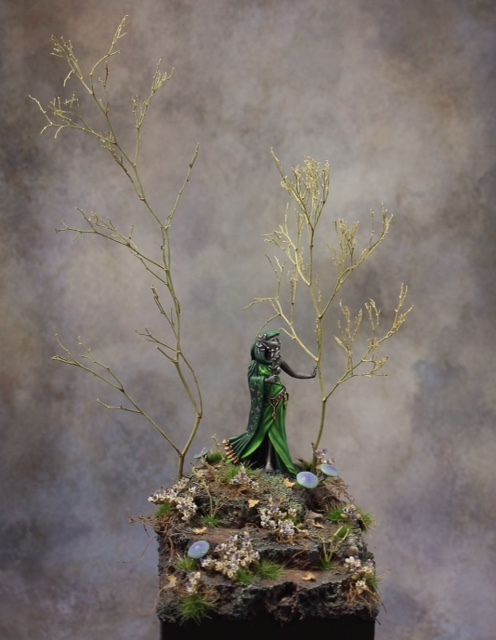 I also entered my Cathedral of the Forest piece into the Single Figure Category and brought home a Silver. 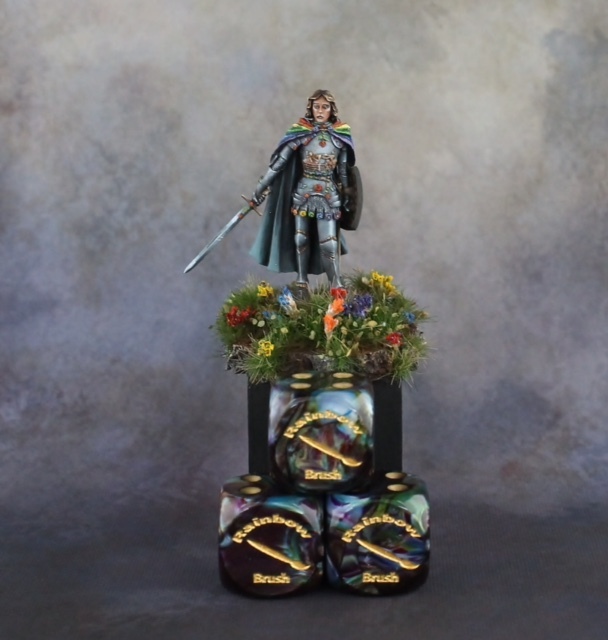 This year was a special year for the painting competition at Gen Con as Marike Reimer put together a special category to support the LGBT community called the Rainbow Brush. The response and support were amazing. It was touching to see the community come together and it was quite clear how much work Marike put into running the event. 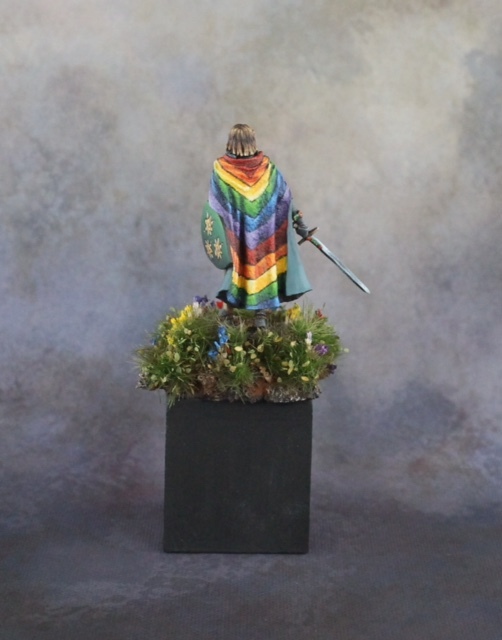 My own humble entry to the Rainbow Brush was Dark Sword’s Ser Loras painted as Lord Commander of Renly’s Rainbow Guard. He was always awarded a Silver and picked by Marike herself for a Judge’s Choice award for the Rainbow Brush. I feel so lucky to have done so well this year and must Thank everyone who helps organize the competition as well as all the companies who offer prize support. I also thank all the awesome artists who bring amazing miniatures to the show and also so freely offer advice and feedback. Overall Gen Con was a raging success and I hope to keep in touch with so many people new and old. Can’t wait until next year. It’s almost that time of year again. I can’t wait to be back in Indianapolis among friends and fellow gamers. This year is the first I will be running an event, and I am very much looking forward to it. 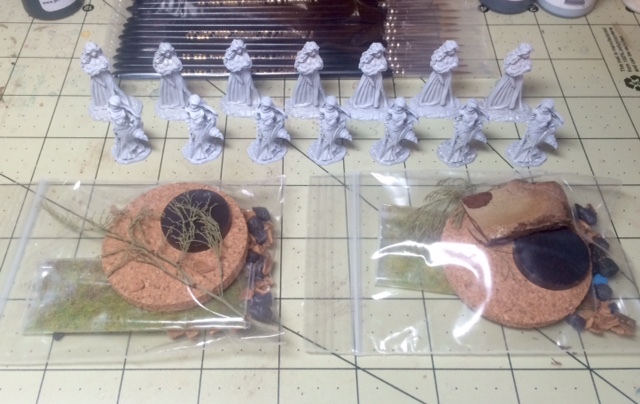 I always fit in time for a least a miniature painting class or two while at Gen Con and decided it is time I give back. So I am running two sessions of a beginners painting class. Currently both are sold out, however if I have learned anything at Gen Con its that there are always no shows or people who return tickets at the show. 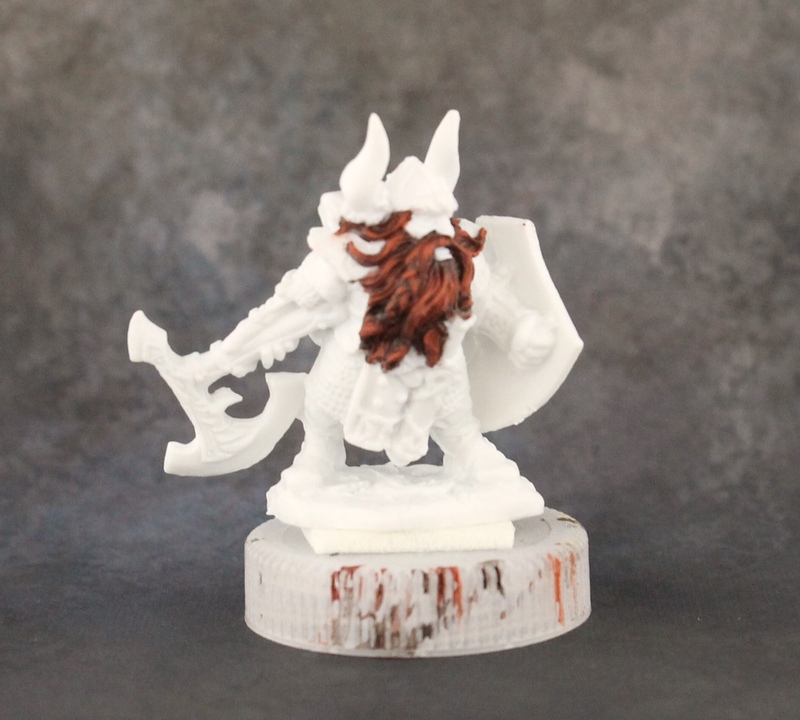 So if you were hoping for a beginners miniature painting class bring some generics and stop by I plan to keep the class size small, but if there are no shows I will accept generics. Event information is below. 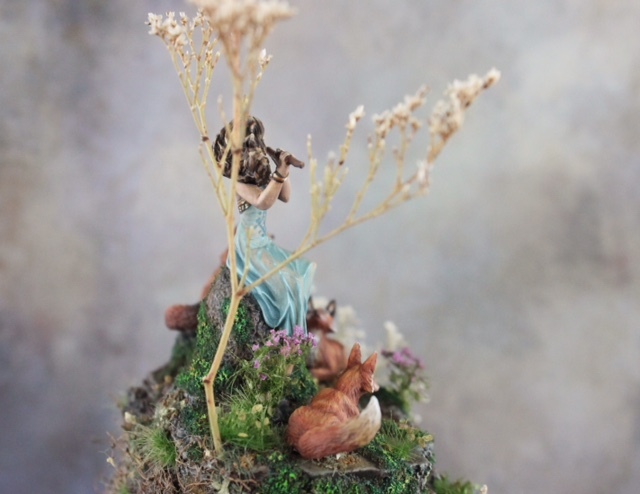 Thursday 3pm-5pm MHE1572397 Miniature Painting for Beginners and Beyond. 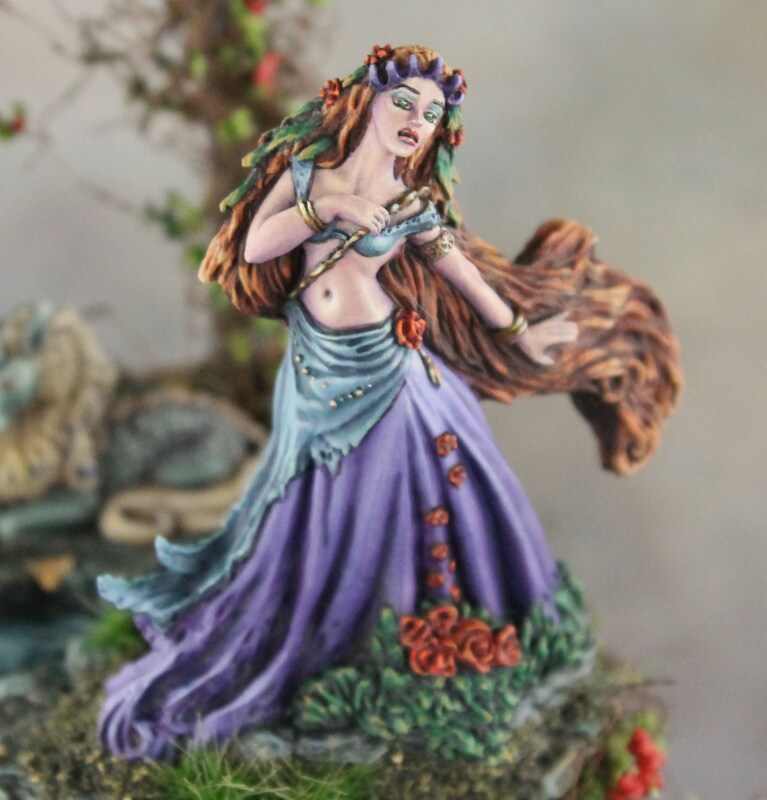 Friday 6pm-8pm MHE1582396 Miniature Painting for Beginners and Beyond. Also Friday I will have some free time after the class if anyone wants to stop by to chat about miniatures or even find some open table space to paint. As I finished up some prep work for my classes I took a quick picture of the lovely ladies that we will be working on during my class as well as some basing bits and brushes. I look forward to be leaving for Indy soon and of course having a blast gaming and painting. See everyone there. I was finally able to make it to ReaperCon and I had a blast. 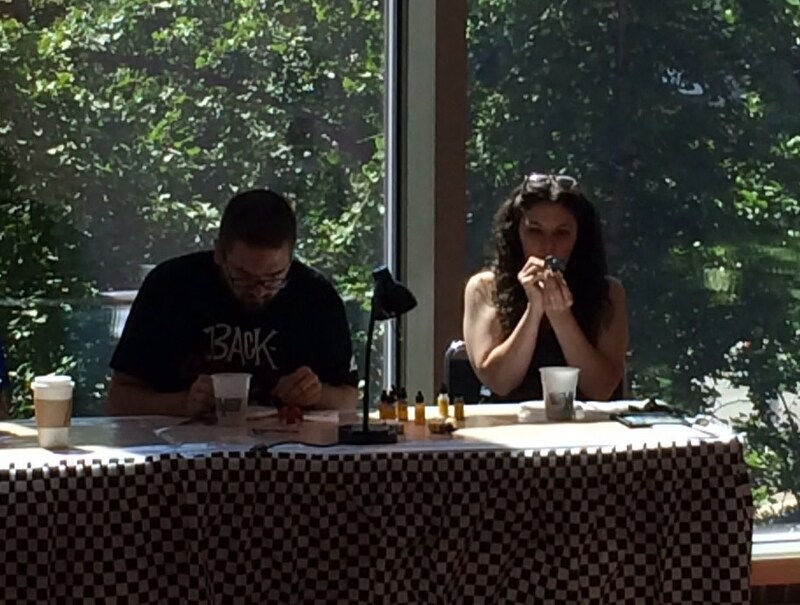 So many awesome people, inspiring artists, fun games and beautiful miniatures. I wish I had brought a camera but my luggage was already quite hefty so it didn’t make the cut. 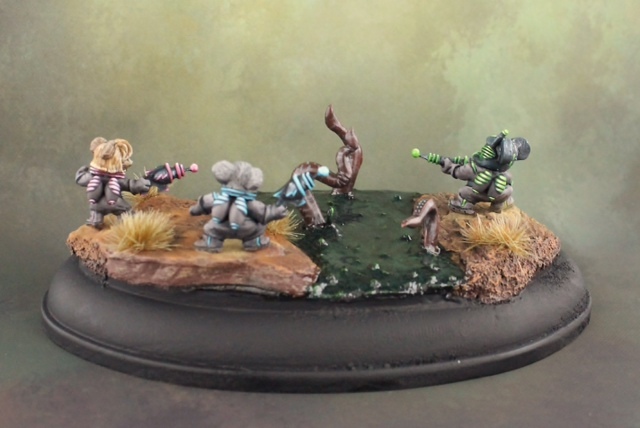 Please check out https://reapercon.com/mspopen/2015 for photos of all the entries and of course the awards each painter received. 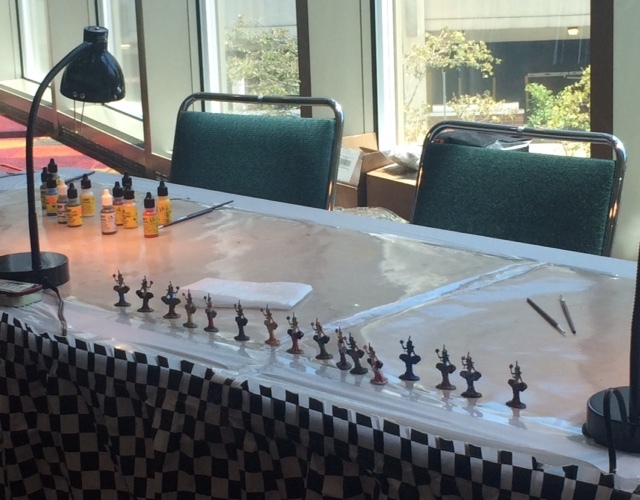 Congratulations to all the painters as everyone did a fantastic job and brought so many awesome minis. 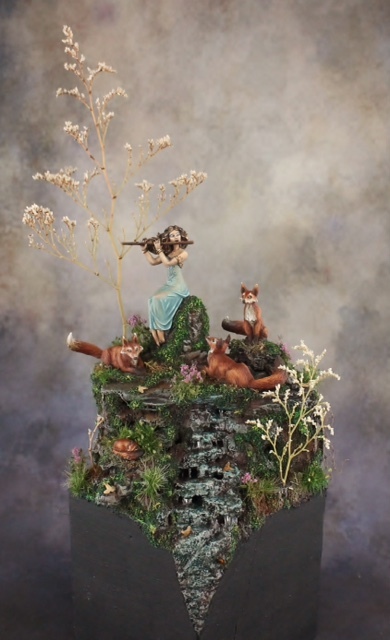 I was most looking forward to the classes I had signed up for with great artists such as Jessica Rich, Justin McCoy, Bob Ridolfi, James Wappell, Derek Shubert, and Michael Proctor. I enjoyed all my classes and learned quite a bit from them. I hope to soon be able to apply some new techniques on a few new pieces. All of the attendees I met were also awesome and I quite enjoyed meeting so many people from the Reaper forums and making new friends. I wish I had more time to do so much more while I was there but like all Conventions there is only so much one can do. The rest will have to be saved for another year. I didn’t plan entries too much for this year as I was uncertain I would be able to enter as I had to leave super early Sunday and if pick up times would allow me to enter. Luckily Debbie assured me if I entered I could pick them up Saturday night. So I brought four pieces with me that I entered across three categories. I was very lucky to have each qualify for an award. In total I brought home one gold, two silvers and two manufacturer awards. Quite the honor and I was quite surprised. 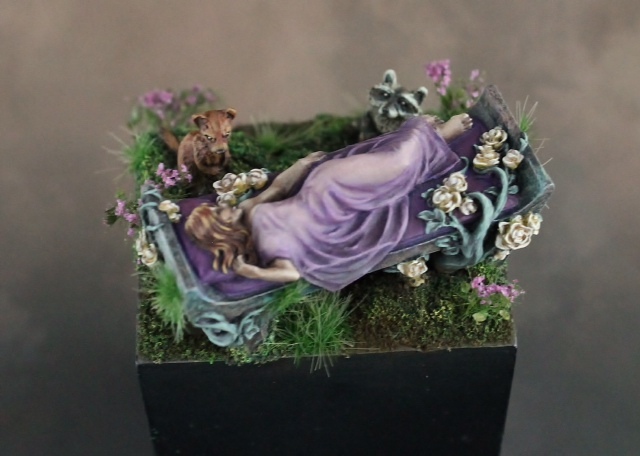 I entered two miniatures into the Painter’s Category and my “Waiting for Prince Charming” Reaper Miniature’s Sleeping beauty sculpted by Julie Guthrie earned a silver. 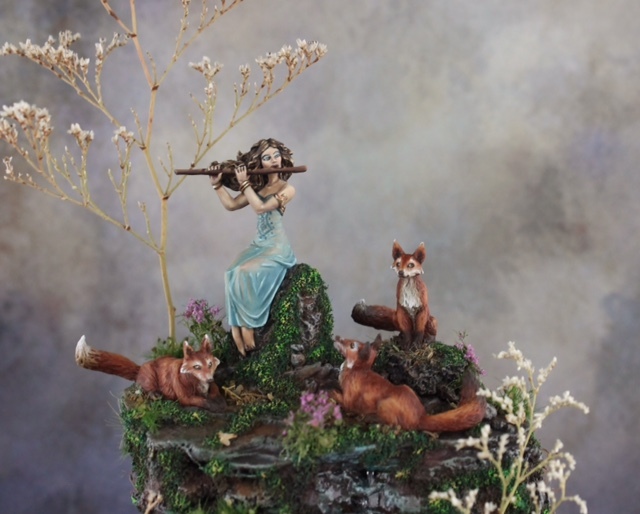 This piece began as a practice piece for sheer cloth and I quite liked the outcome so gave her a display base with a few critters. My second painters entry was a DGS Freeblade fire wizard. 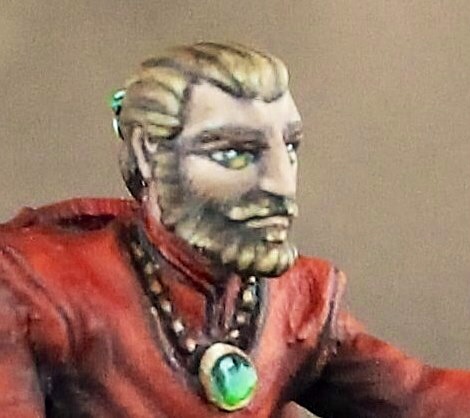 I painted him up for my husband to use as his Red Robe Wizard of High Sorcery for our Dragonlance campaign. Since Sleeping Beauty was selected to judge for the category he didn’t earn a medal. However he was selected as the DGS Freeblade Best of Show manufacturer award to my surprise. 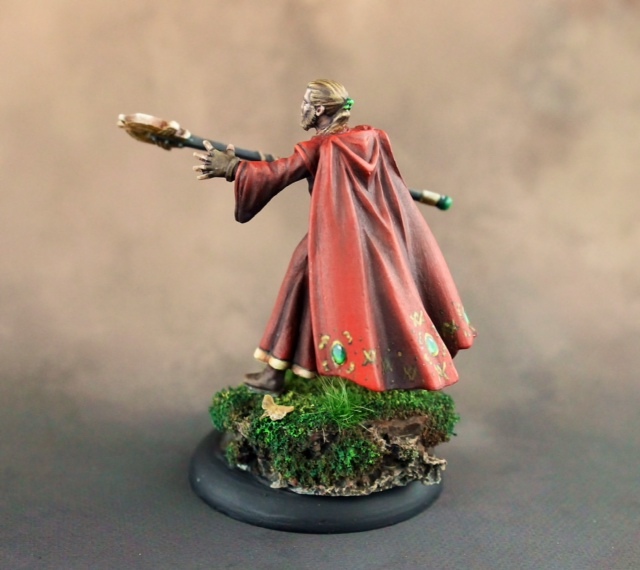 I quite enjoyed painting him up even though red is not usually a color I would choose for a competition figure, but since he will be used for gaming I needed him in red robes. Here are a few shots including a closeup of his face. 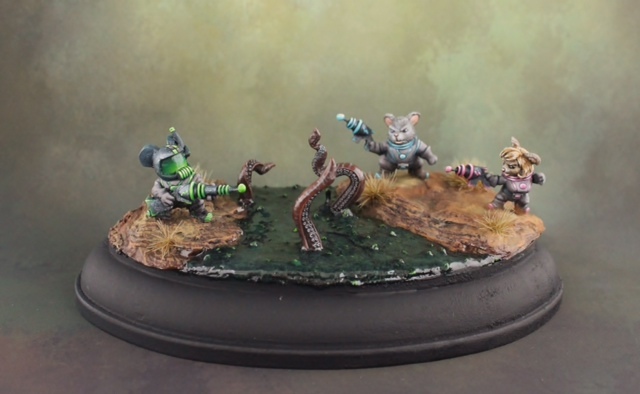 And lastly my final piece was Reaper Miniature’s Space Mouslings Diorama “Tenta Squeal, Tenta Squeek, Tenta Kill”. This was a fun little piece I put together right before the convention. I was quite happy that they brought me home my second silver. Overall the show was a blast. I learned alot, enjoyed meeting so many inspiring painters of all levels, and was able to see amazing miniatures up close. 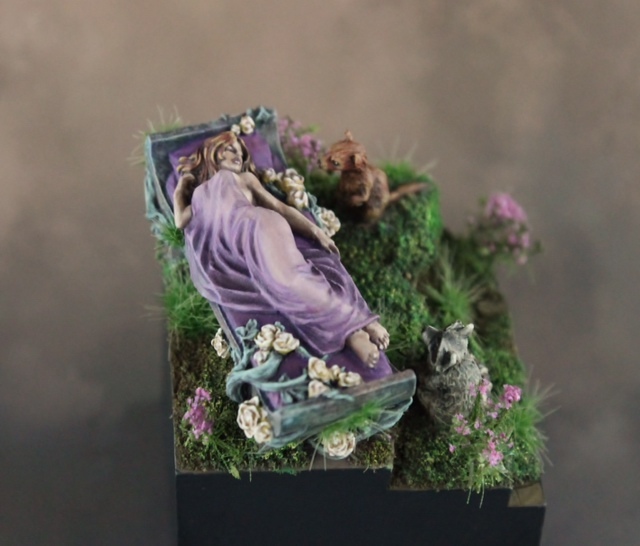 I would recommend any miniature lover or painter to attend if possible. I hope I can make it back soon. Thank you to all the people who helped make ReaperCon happen and a special Thank you to all the artists teaching classes and judging. I imagine it would be quite demanding and challenging and everyone was great. To all the people who personally spent time chatting with me thank you as you all are what makes the miniature painting community so special. Hope to see some of you at Gen Con. 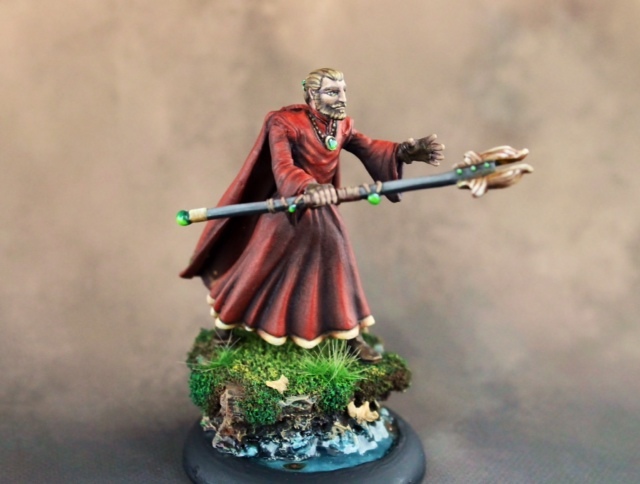 I have been working on painting more this year and to assist with this I have joined the Resolution Challenge on the Reaper Forums. So far it has really helped me paint more miniatures this year. even if a few are quick paint jobs or speed paints. Then during a board game night my gaming group challenged me to speed paint a mini while playing five tribes and to make it a bit sweeter if I managed it and also won the game my DM said he would give us a level bonus. So I figured why not I washed him in some soap and water, dried him off and got to painting. To my surprise I did manage to win the game by about 35 points. 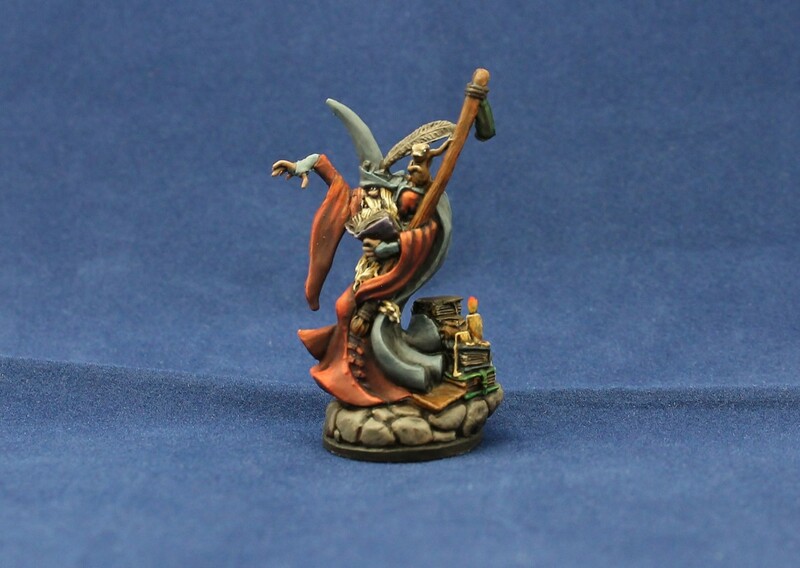 Not to mention now our wizard will have a painted figure for his character. 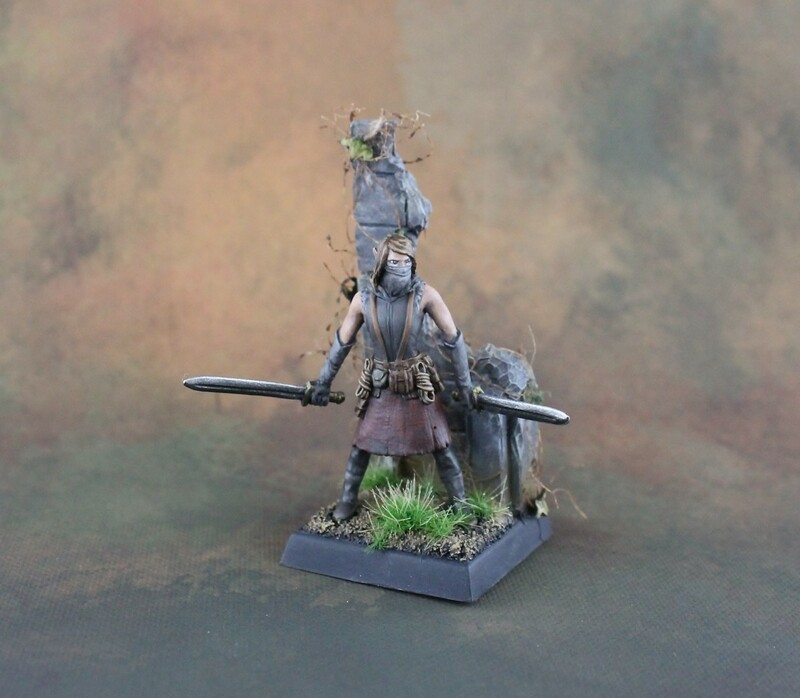 Without further ado here is Kieran Tallowmire a fun bones mini with lots of detail. He has a little over 2 hours in him, although I easily could’ve spent much more to clean him up a bit and pick out more details. I am looking forward to picking up his upcoming metal release and taking my time painting him again. 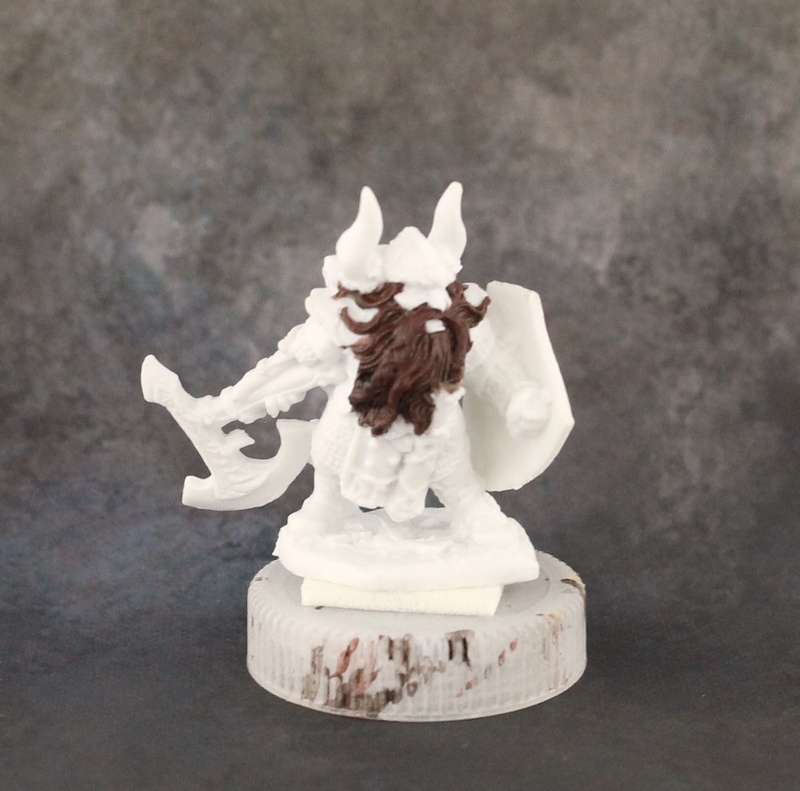 And lastly I speed painted some bugbears as well recently. 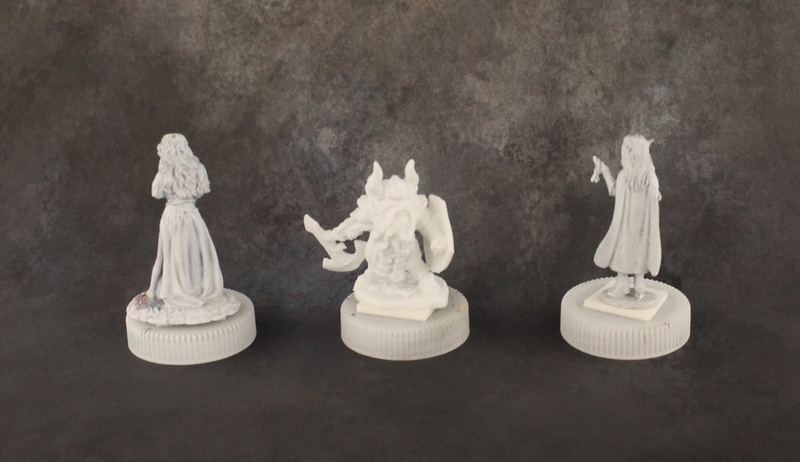 I received my Bones II from Reaper’s Kickstarter and went to sorting out the monsters first. Of course once I finished sorting them I had to get a start on at least some of them. So I washed up the bugbears and painted all six in about 4 hours. They are certainly not terribly pretty and since they are bones I left the mold lines, but now we have a fair amount of painted bugbears for future encounters. 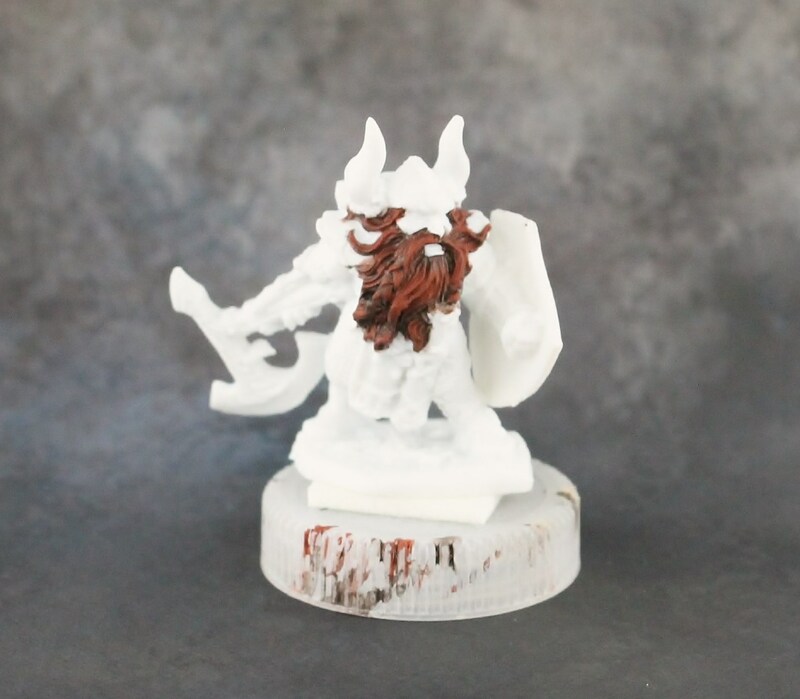 I must say I am quite happy with the quality of their sculpts overall and they are easy speed paints. Another year another faction. 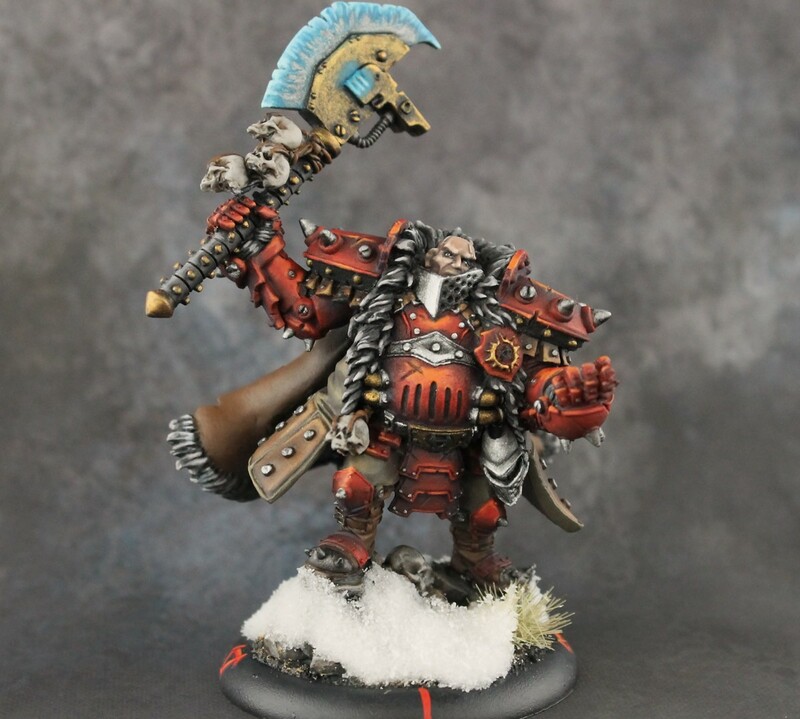 This year we have chosen Khador to start a small list for. 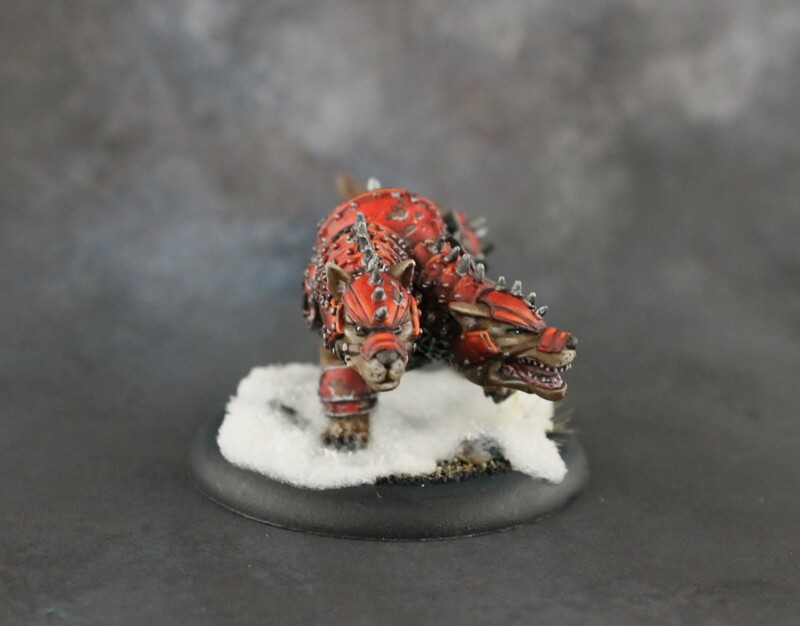 With the new Khador All in One Army boxes release, I figured it was time to paint up a caster for them. 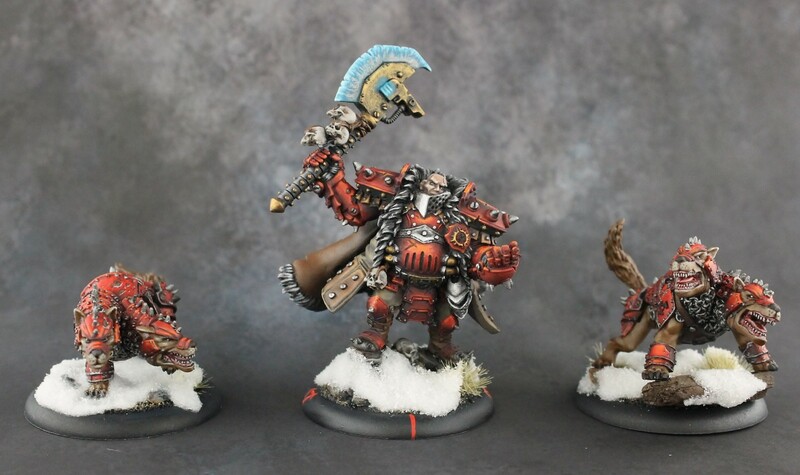 What better way to start an army then with an Epic Warcaster Unit. Here is my version of Orsus Zoktavir, The Butcher Unleashed. These guys were fun to paint up and gave me an excuse to practice the color red. 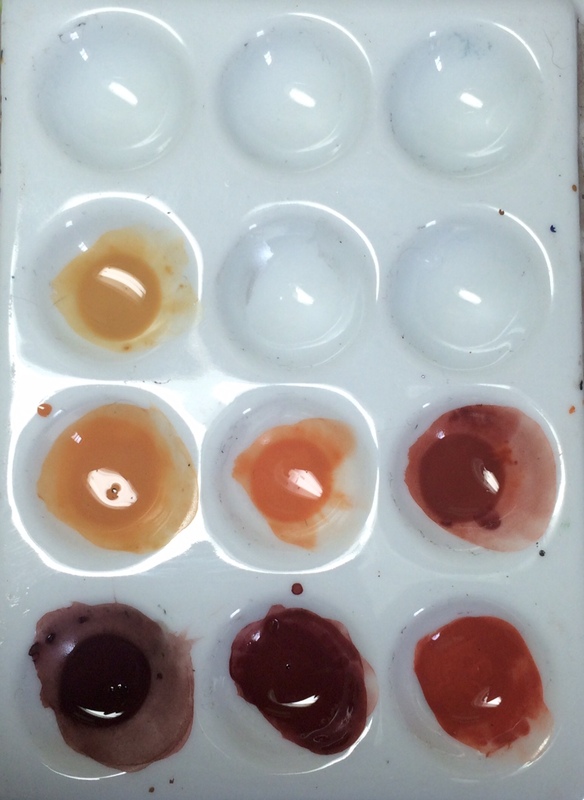 I pushed the shadows of the red almost to pure Exile Blue in the deepest shadows and highlighted it up to an orange red. Now to paint up some more and field them on the battlefield. I can’t wait to see how they play.